Sony gave Blu-ray a big push last year by launching a wide range of players that were not only high on features, but low on price. Now you can pick up those players, including the BDP-S570, a highly specified model, for silly money, which makes it a very tough player to beat on value. The so-called Monolithic Design (the thinnest on the market at launch) is impractical, as the odd front panel collects dust and hides its tiny buttons from view. Meanwhile, the rear panel doesn't leave room for analogue multichannel outputs. In almost all other respects though, this is a remarkable machine. The disc loading time, which used to be so infuriatingly slow, is now down to just a few seconds. A fair result for the component output, while the composite one is merely average. 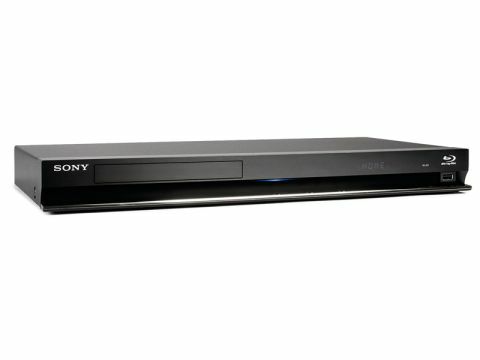 Speedy booting and disc loading - for its 2010 models, Sony has addressed past criticisms. The user interface, a copy of the Xross Media Bar on the PS3, is superbly intuitive and very responsive using the no-nonsense remote control. And on the menu you'll also notice lots of online content that includes Daily Motion and catch-up TV services, all of which pop open quite quickly. Picture quality is spot on, too. A clean and naturally coloured picture hits your screen – a factor that also helps in 3D mode. There's a tangible sense of depth here, great detail resolution, and no video noise. Then there's the surprise inclusion of SACD compatibility. It's just a shame that there isn't a multichannel output with which to send this uncompressed audio signal to legacy AV receivers that pre-date HDMI v1.3.